There's only ever been one place where your heart belongs. It's the place where four cars on the dirt road is "traffic." It's where your co-workers wear leather because they were born with it, probably in a straw bed spread on a concrete floor. It's where 9-to-5 hours are somebody's idea of a joke, you're intimately familiar with the body parts of animals you never thought you'd be intimately familiar with, and the "rat race" only happens in the granary. Yep, your heart belongs in the country and it always has. 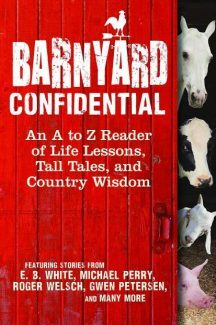 So why not spend some reading time there, too, with the book "Barnyard Confidential" by various authors (including Gwen Petersen), edited by Melinda Keefe. Folks who live in the country are exceptionally fortunate. In the country, people visit, go courting, and do a lot of porch sitting. There's quilting (oftentimes in a group), harvesting (ditto) and lots of fresh, homegrown meals on the table, invitations welcome, thanks. For the mechanically-minded, the country is a bounty of goodness. There are augers on farms and ranches, the use of which will give you "a fanatical hatred of shovels." You'll find branding irons, always accompanied by the south end of a calf and the words, "Look out!" You'll find all kinds of tractors, some in one form of "fix" or another — which leads us to one of the most interesting places in the country: the machinery graveyard. There are buildings in the country that you'd probably never find anywhere else; a corn crib, for one, because where else would you store your corn? You'll sometimes find a mill out near a pond and sometimes, it works. You'll find all kinds of sheds in the country, as well as hoppers, granaries and outhouses. The country is where you pick up after your animals, only to cast it all over the ground again. It's a place where kids, dirt and chores all go naturally together. Where a farmer or rancher must know "about 150" different trades and professions to run his spread right. It's where baling twine and barbed wire are multipurpose tools. And it's a place of miracles, as anyone who's ever held a baby chick, watched a newborn colt, birthed a lamb or seen a new Mama cow can attest. Surely, someone at some time or another has asked you why you live in the country. 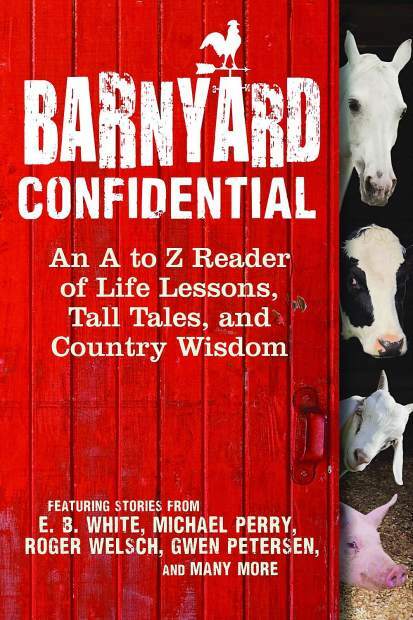 If you didn't have a quick answer, "Barnyard Confidential" gives you dozens of reasons from A to Z.
Flip through this book and you'll find pictures that will bring back memories. Stop on a page and learn about maple syrup, electric fences, manure and farmer's dress codes. Read Michael Perry's musing on his father's sheep. Learn how to talk like a farmer. See Terry Chamberlain's warning about country music, Ben Logan's words on a farm kitchen, Patricia Penton Leimbach's thoughts on junk, and E.B. White's reasons why you shouldn't procrastinate.